Thonglor was long known as a residential area which is popular among the Japanese expat community and well heeled Thais. With the development in Bangkok, Thonglor has been evolving and furthering into a fashionable and creative district bursting with unique shopping outlets, enticing eateries and sophisticated nightlife attractions. Located in the heart of Thonglor, akyra Thonglor Bangkok Hotel is in the center of all the actions. Parallel with the development of the area, akyra Thonglor Bangkok itself is rejuvenating. Within a year it will transform into a lifestyle urban hotel in line with akyra spirit. Not only rooms, but the entire public areas will have the new shine of resurrected 1920’ design and atmosphere. The tenth and eleventh floors at akyra Thonglor Bangkok are now part of that creative and appealing nightlife scene with impressive dining and drinking experiences. The interiors of the hotel are the height of luxury, glamour and good taste, with three new upmarket outlets – The Presidente Lounge, Otto Pool Bar and Som Tam & Chardonnay Restaurant – serving a choice of fabulous food and top quality drinks in sophisticated, art-inspired surroundings. THE PRESIDENTE LOUNGE- is an art-deco sanctuary with a choice of plush seating and private alcoves to gather with friends or family while enjoying afternoon tea, or relax with coffee, cake or a glass of wine after a long day shopping in the Bangkok malls. 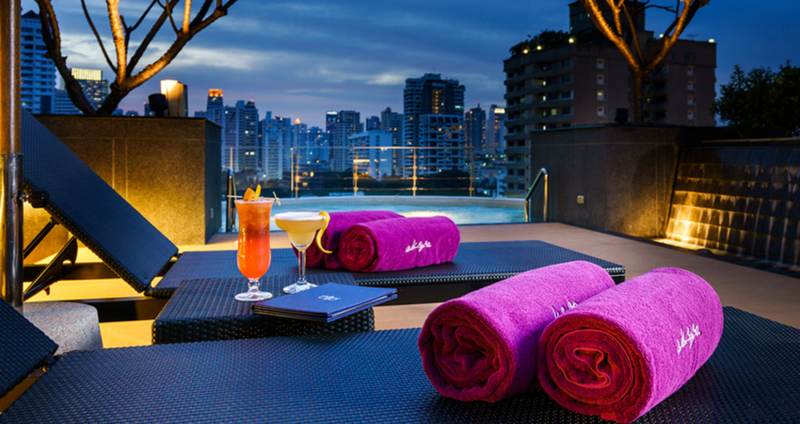 OTTO POOL BAR - offers resort-style living with comfortable outdoor seating by the expansive double infinity-edged pool that boasts 180-degree views across Bangkok’s leafy residential enclaves. The bar serves a selection of refreshing beverages, including Asahi Extra Cold draft beer, cooled to minus 2.2 degrees and perfect for a balmy Bangkok evening. SOM TAM & CHARDONNAY RESTAURANT - is a bright, spacious dining destination based on an East Meets West concept with exquisite Thai cuisine complemented by international specials and a wide selection of fine wines to bring out the flavour of the freshest ingredients. The restaurant lives up to its name with no less than 5 different Som Tam dishes on the menu; Thailand’s famous green papaya salad, served with shrimp, soft shell crab, fish, Thai sausage or even as a mixed fruit platter. Som Tam & Chardonnay opens onto the expansive pool terrace and is also the venue for the daily gourmet breakfast, an indulgent spread providing a nourishing start to an inspiring day in the city. akyra Sukhumvit Bangkok Hotel will add to the capital delights and offer even more unforgettable taste adventures. 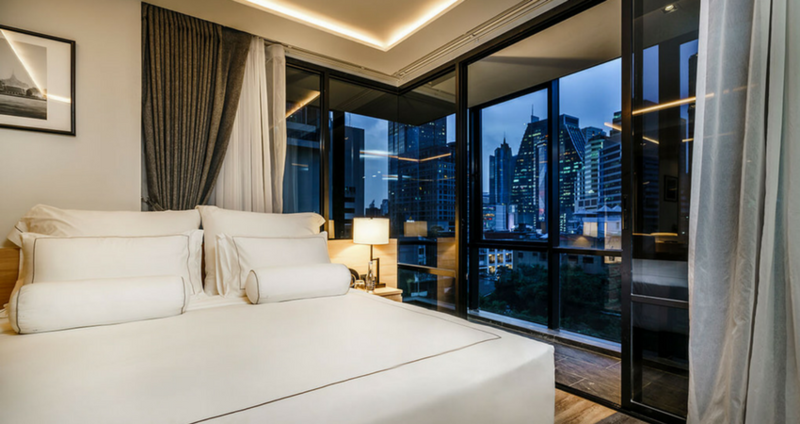 Located on Sukhumvit 20, in the buzzing tourist district, close to the city’s famous Asok intersection, the luxury boutique hotel will emphasize an “All Time Experience” concept through exciting facilities and services to complement the varied attractions nearby. An expertise initiated by the acclaimed and awarded sister property Rise Rooftop Bar in akyra Manor Chiang Mai, Rise Rooftop Bar & Dining pursues its excellence into mixology and cuisine. Offering no less than 20 Thai craft beers and astonishing Southeast Asian influenced cocktails, complemented with light bites,the hotel’s sophisticated rooftop will also feature a stylish pool bar with sun loungers and cabanas positioned around reflective water and dramatic vistas of Bangkok’s modern architectural achievements. This lifestyle area will offer an enticing spot with spacious and edgy design, fueled with live music and entertainment for sundowners to gather after work or before heading out into the city. Both akyra hotel in Bangkok offer their own distinctive gourmet experience and each one is defined by a strong sense of style and independence that sets the akyra brand apart from other boutique hospitality brands.